Kidney stones appear at all ages. They are common in older people, but also in the middle aged. They are seen in infants and toddlers, but also in teens and young adults. About 80% of them are calcium stones, 10% struvite stones (from urinary tract infections), and 10% crystallised uric acid, but uric acid ‘seeds’ also promote the formation of calcium stones. That this is so naturally implies that chronic kidney dysfunction must also be common. Pain associated with a kidney stone can be sharp or dull, mostly depending on the size of the stone either partially blocking or passing through a calix in the kidney or the ureter from the kidney to the bladder, and usually expresses itself as pain in the back or side (easily mistaken for muscular strain), in the abdominal area (easily mistaken for indigestion) or in the groin above which sits the bladder. That such a pain should appear and persist when there are no reasons to suspect either muscle soreness or indigestion indicates that the problem may well be with one or both of the kidneys. We take almost everything for granted. That we should have air that is not toxic to breathe, water that is not polluted to drink, food that is not contaminated to eat. That we should have a comfortable and warm place to live and work, hot water to shower and bathe whenever we wish, running water wherever we find ourselves. That there should be living plants, insects and animals; soils in which can be planted seeds that will grow; rivers, lakes, seas and oceans in which fish can live, thrive and multiply; mountains, forests and plains in which trees, bushes and grass, beasts, birds and bugs, and every living thing can also not just survive, but thrive. We take these for granted, maybe all the time, and if not, probably most of the time. It is, unfortunately, more than obvious that we should not. That we take almost everything for granted is even more remarkable when we consider this bodymind (that we customarily and mistakenly call ours), with its countless numbers of specialised cells and tissues, its amazingly intricate organs and systems, and its multitude of facets and functions. What happens when we breathe in, and then when we breathe out? What happens when we drink a glass of water or when instead we drink a glass of juice? What happens when we drink a glass of Coke or a glass of wine? What happens when we eat something: when we eat a an apple or a cucumber, a carrot or a celery stick, a potato or an avocado; when we eat an almond or a walnut, pumpkin or sunflower seeds; when we eat meat or fish, eggs or cheese, olive oil, fresh butter or coconut oil; and what happens when we eat burgers and fries, doughnuts, cookies, cake and candy? What happens in the stomach, in the pancreas, in the liver, in the gall bladder, in the small intestine and in the colon? What happens during the process of digestion? How does digestion take place? What happens in the kidneys? What happens in the bloodstream? What happens in the brain? Most of us have no idea. But we should, should we not? We take it all for granted: that everything will just work; everything will take care of itself; the body will take care of us. Although this can happen, sometimes, in general it doesn’t. But it should, shouldn’t it? Why does it escape us so thoroughly that this bodymind—every single cell in it—is entirely made from what we eat, drink and breathe? It is so obvious and yet it eludes us. And so, we must consciously come back to this again and again. When we begin to explore the physiology of the body to find out how things work, we find that both the complexity with which we can appreciate, and the understanding of the various functions and interactions, arrange themselves in layers from coarse and superficial to more subtle and profound. Inevitably, as appreciation and understanding deepen, it becomes impossible to find all of it anything less than amazing. And although this can be said for many, maybe even for all organs, it is particularly true in this case: the kidney is an evolutionary marvel, a true jewel of physiological evolution in animals. 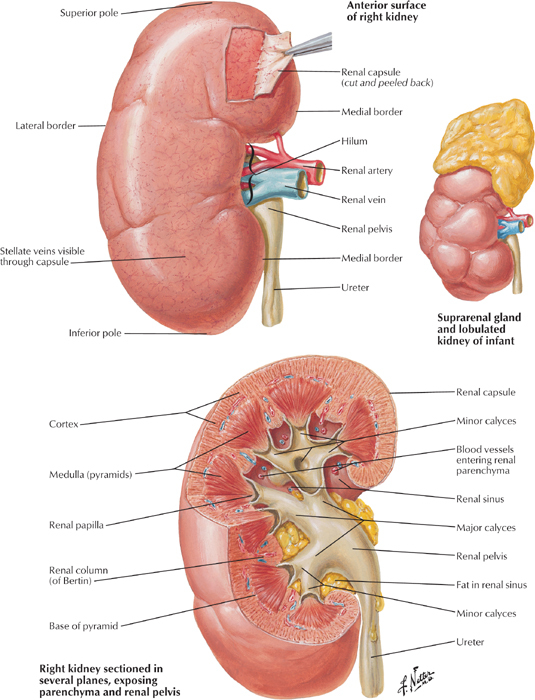 The kidney is without any doubt one of, if not the most refined organ both in architecture and function. To pack together so many tiny, delicate structures, working both independently and in unison in an array of such intricate, complex and subtle functions and interactions is truly mind boggling and awe inspiring. This fact is totally under-appreciated. And for this very reason, I feel it extremely important to raise the point now and bring it to your attention before moving on, so that it can remain clear throughout your reading of this article. I hope that with an understanding of what the kidneys do, how they function and what they need, this appreciation will become permanent for you, coming up on its own every time you drink a glass of water, and also every time you remember that you should have. The kidneys are two bean shaped organs typically 11 cm in height, 6 cm across and 3 cm thick, on top of which sit the suprarenal (as in: above-the-kidney) or adrenal glands. They are located deep in the abdomen close to the spine, one on either side, in the area of the lower back, just below the rib cage, protected in part by the last couple of ribs but mostly by the tick muscles of the back. The kidney has four main components: a thin layer that covers it like a thick skin called the capsule; a thicker layer just beneath the capsule called the cortex (outer layer), in which are most of the arteries and veins; the inner layer called the medulla (middle layer) constituted by conical structures called the pyramids (there are usually 7 of them in humans) with their wide part or base in the cortex and their tips pointing inwards towards the innermost part of the kidney; and finally the pelvis (base) with its calyces connecting to the ureter. As for everything that relates to health, understanding how to promote optimal function of a cell, tissue, organ or system requires understanding how it works. It is important to remember that every living cell and organelle does what it does not for our sake, but to maximise its own prospects for survival. When we understand what an organ is trying to do, then we can understand what is needed to make sure that it can do it with ease and efficiency. And when the organ functions with ease and efficiency, it functions optimally. This is the approach to use to maximise our prospects for living a long, healthy and happy life. So, what is the kidney trying to do? One: Take out of the blood metabolic wastes and toxins, primarily urea, uric acid and creatinine, all resulting from protein metabolism, while keeping as much as possible of the useful stuff, especially water, minerals and amino acids. Two: Maintain blood electrolyte balance (sodium, chloride and potassium; calcium, magnesium and phosphate), pH (bicarbonate and hydrogen) and osmolarity (concentration of solutes in general). Three: Regulate body fluid content and blood volume and pressure. Sodium is the most important electrolyte and blood pressure regulator, and therefore most closely monitored by the kidney. What are the main metabolic waste products? Urea results primarily from the breakdown (oxidation) of amino acids that are not used to build tissue, i.e., protein intake in excess of what can be used at any given time to build and repair cells, (but also from our own tissues). Urea also result from the conversion of ammonia, another byproduct of protein digestion which is so acidic that in high concentration it can cause cell death. The kidney, therefore, tries to eliminate as much as possible of the urea, recycling only what it must depending on the body’s needs, especially to increase water re-absorption when there is dehydration. Uric acid comes from the breakdown of purines. Some are present in our own cells, and so the natural recycling of the components of dead ones produces uric acid on a more or less continual basis and at a more or less elevated rate depending on how quickly cells are dying (the rate of ageing). Purines are also present in foods we eat and drink: mostly protein-rich foods and alcohol containing drinks like wine and beer. The more purines are present, the more uric acid is produced. All the uric acid needs to be eliminated. When the urine is too concentrated and acidic, however, uric acid cannot be dissolved and thus crystallises. Creatinine is a breakdown by-product of creatine phosphate, an energy storage molecule used mostly in cells with fluctuating energy needs like those in the muscles and brain. Creatine is made from three amino acids in two steps: the kidney combines the arginine and glycine, and then the liver binds on methionine. Creatine is then transported in the bloodstream to muscles where it is made into creatine phosphate and back to creatine as needed. In the first few seconds of an intense muscular effort or brain activity, creatine phosphate can lend a phosphate group to ADP (adenosine di-phosphate) to form ATP (adenosine tri-phosphate, the energy currency of cells), and help supply the needed energy. Very conveniently, if later there is extra ATP floating around not being used, creatine will take back a phosphate group from the ATP molecule, leaving the latter as ADP, and storing the former for future needs as creatine phosphate once more. Creatine is eventually broken down to creatinine and must be completely eliminated by the kidneys. The need for and use of creatine phosphate depends primarily on muscle mass and level of activity. Therefore, so does production of creatinine. How does the kidney do what it does? By filtering the blood. And the kidneys filter a lot of blood. About 25% of all the blood coming out of the heart flows through them. This is on average 1.2 litres per minute, which amounts to more than 1700 litres per day! Since there are 4-5 litres of blood in the body, it means that every drop goes through the kidneys about 400 times each day! Since the overall flow and pressure of the system must be maintained, only around 20% of the blood flowing through the kidney is filtered (that’s 240 ml/min and 340 l/day). The renal artery supplies the blood, and branches out into smaller arteries that also branch out into smaller arterioles all the way to the filtering unit. Because half of the blood volume is water, this amounts to 850 (1700/2) litres per day flowing through the kidneys. Filtering 20% means that 170 litres of water are filtered each day. Therefore, if one litre of urine is produced and excreted over the course of 24 hours (that’s pretty typical, unfortunately), it means that 169 out of 170 of these litres of water are reabsorbed: a reabsorption efficiency of 99.4% (169/170)! Producing two litres of urine eases this down to an efficiency of merely 98.8% (168/170). Now, that’s what we call high running efficiency. Stage one: Bowman’s Capsule The blood coming into the nephron first enters a little spheroidal structure 0.3 mm in diameter (Bowman’s capsule) where about 20% of it is mechanically filtered to separate the fluid part called the plasma from the solids. It is ‘mechanical’ in the sense that it is pressure driven and based on particle size: smaller stuff like water, minerals, glucose and amino acids, together with the metabolic waste like urea and uric acid pass through, whereas large stuff like blood cells, proteins and fats do not. This is similar to how a water filter works: the water goes through the porous but densely packed carbon or ceramic block that stops most of the large particles like chemicals and metals, but allows the water to pass. And just as the filtering efficiency of a given filter depends on the pressure of the water supply, the filtering through the glomerulus in Bowman’s capsule depends intimately on the pressure of the blood supply. If the pressure is too low, the filtering is inefficient. But if the pressure is too high the delicate filtering structures are damaged. The pressure must therefore be just right for the circumstances, (the conditions being obviously very different when we are running and when we are sleeping). Stage two: The Proximal Convoluted Tubule The fluid moves from the capsule into the proximal (as in: close-by) tubule. The blood moves from the larger afferent (as in: towards) arteriole where the pressure is monitored before entering Bowman’s capsule, into the smaller efferent (as in: away-from) arteriole after passing through the glomerulus. It is now much thicker and more concentrated. Here, most of the water (about 65%) and almost all sodium are reabsorbed from the filtrate back into the blood, in addition to all of the glucose and amino acids, (none should end up in the urine), and some urea. If the pressure is even slightly lower than it should, the juxtaglomerular (as in: next-to-the-glomerulus) pressure-sensing cells in the afferent and efferent arterioles, secrete renin that flows into the bloodstream, and stimulates the release of angiotensin I from the liver, which is then converted in the lungs to angiotensin II, a powerful vasoconstrictor that promotes the contraction of the blood vessels to raise blood pressure, but also triggers the secretion of aldosterone in the adrenal glands, which in turn stimulates more reabsorption of water and salt in the nephron, also for the purpose of raising blood volume and pressure. Stage three: The Loop of Henle Most of the water and salt, and all the organic molecules like glucose and amino acids are reabsorbed from the filtrate back into the blood through a network of tiny blood vessels (capillaries) in the first part of the proximal convoluted tubule, straight after its emerging from Bowman’s capsule. From there, the vessel changes in shape and direction, and becomes what is named the Loop of Henle: a crucial element of the nephron that has a water-permeable descending limb and a water-impermeable ascending limb. As the filtrate travels down, water moves out because of the higher concentration of sodium in the embedding interstitial medium, and is reabsorbed by tiny capillaries back into the blood. The deeper it descends, the higher the sodium concentration grows, the more water comes out of the filtrate, and thus the more concentrated it becomes. As the concentrated filtrate travels back up along the ascending limb of the loop, it is sodium that is now pulled out, but this time by active transport through little pumps instead of by osmosis as for the water in the descending limb. This is necessary to recover as much sodium as possible and maintain the gradient of concentration of the interstitial medium in which the loop of Henle is embedded. Stage four: The Distal Convoluted Tubule The next leg of the trip—a very important one indeed—is through the distal (as in: distant) tubule. It is here that pH and electrolyte levels are regulated. It is also here that we find the chemo-sensing macula densa cells tucked in between the afferent and efferent arterioles, next to their pressure-sensing juxtaglomerular cells. Blood pH is regulated by either absorbing bicarbonate and secreting protons to increase acidity, or vice versa, (without a doubt the much more common alternative), by secreting bicarbonate and absorbing protons to make the blood more alkaline. Sodium can be left to be excreted or it can be reabsorbed and potassium secreted into the bloodstream under the influence of the hormone aldosterone, and calcium can also be excreted or reabsorbed but in this case under the influence of parathyroid hormone or PTH. Stage five: The Collecting Duct The distal convoluted tubule is endowed with a system of collecting tubules to which is delivered the filtrate, (now practically urine), and that merge into the main collecting duct that carries the liquid to the ureter into the bladder. On this final stretch in the collecting duct through the interstitial medium of the nephron, a little more water can be squeeze out of the already concentrated urine. This, however, only happens in the presence of the very important hormone vasopressin (also called anti diuretic hormone or ADH), which is secreted when the body is dehydrated. This amazing process takes place in millions of nephrons tightly packed and organised in each of the two kidneys, continuously throughout the day and night, from the moment the kidney starts to work in the not yet born child, to the moment we die, either from kidney failure or something else. And to appreciate just how amazing it really is, consider this back-of-the-envelope calculation: 1 million nephrons are packed into 7 pyramids makes about 150 000 per pyramid. Taking a pyramid to be a cone with a base of 2 cm in diameter gives a surface area for the base of about 3 cm squared (Pi*R^2, and R=1). Dividing 150 000 nephrons by this surface area in which all of them must be packed gives a density of 50 000 nephrons per squared cm. Since there are 100 squared mm in 1 squared cm, this makes a density of 500 nephrons in every square mm over the surface of the base of each pyramid, and remember that they must all squeeze in together even more as they penetrate towards the tip of the pyramid and its collecting calyx. Can you even imagine how small this is, without even considering the incredible complexity with which it all works? Gray’s Anatomy states that the thin part of the Loop of Henle is 30 microns in diameter, whereas its thick part is 60 microns, and it is safe to assume that most tubular parts of the nephron are probably also in this range. This is truly amazing. But appreciating this, we can also appreciate how incredibly fragile each nephron must be. And by the way, once a nephron is dead, it’s dead forever. Now, blood pressure is intimately related to blood volume (amount of water in it) and blood osmolarity (the concentration of solutes, mostly sodium, and to a lesser extent the other electrolytes as well as glucose). Maintaining these in balance is essential to the functioning of everything in the body. For this reason, there are pressure sensors throughout every blood vessel, and osmolarity sensors in the hypothalamus of the brain, as well as highly sensitive sensors of both kinds in the kidney itself. A drop in volume sensed by the pressure sensors in the blood vessels, or a rise in solute concentration sensed in the hypothalamus, will trigger the release of vasopressin from the pituitary gland. Vasopressin will signal the kidney (the collecting duct) to release more water for reabsorption into the blood stream, in order to counter the drop in blood volume and rise in solute concentration. Vasopressin, just as angiotensin, will make the blood vessels constrict and tighten to maintain the blood pressure constant. It will also stimulate the secretion of glucose from the liver in case fast reaction times become necessary, as well as clotting factors and platelets to make the blood thicker and stickier, and prevent excessive blood losses in case of injury. All of these are part of the standard stress response. Vasopressin will also stimulate the secretion of the stress-induced adrenocorticotropic hormone or ACTH that will act to reinforce all of the above in what will amount to a heightened stress response. Dehydration—especially chronic dehydration—is probably the greatest source of physical stress in most of us. We, unfortunately, tend to live our lives completely oblivious to this fact, and therefore suffer the consequences a little more acutely with each day that passes. Although all of this is in many ways awfully complicated, what we need to do to make sure the kidneys function properly is quite simple: drink more water, take more magnesium and less calcium, alkalise the body and its tissues. More water This is by far the most important: proper hydration by drinking plenty of water—not fluids in general, just plain water—especially in the morning when the body is most dehydrated, before eating anything, and then before each meal. Imagine what would happen to a water filter if the incoming water were just slightly cloudy with dissolved clay particles? It would work, but over time, (obviously faster than it would in the absence of clay), it would get clogged up. Now, what if there were more fine clay particles? The filter would get clogged up faster given that its role is to stop and store the particles so that the water coming out can be clean and clear. But in addition to that, because the incoming water would necessarily be thicker and more viscous, the filter would not work as well under the same pressure. To work properly it would need a higher pressure to help push through the more viscous water, but this higher pressure (if it could be adjusted upwards) would inevitably stress the filtration system as a whole and thus shorten its ‘life’. What if, in the extreme, the incoming water were really thick, brown and muddy? It’s pretty simple: no water would make it out of the filter because it would instantly clog up. This analogy is definitely not exact but it is clear and adequately illustrative. To function well, the kidney needs the right blood pressure, blood flow, blood volume, blood viscosity and osmolarity (concentration). As soon as either pressure, volume or sodium concentration drops, the renin-angiotensin-aldosterone is activated and reinforced by the stress response related to secretion of vasopressin (anti diuretic hormone), all acting to constrict the blood vessels, make the blood more viscous and increase reabsorption of both water and sodium to re-establish a functional equilibrium. Imagine now this thick, viscous, sticky blood going through the exceedingly fine arterioles and capillaries in the nephron, and the difficulty with which wastes would be filtered out and dissolved in the water that should be available but isn’t. Now, picture this happening throughout the 24 hours of the day, week after week and year after year. It’s no wonder kidney problems are so common! So, at the very least we should drink one litre before breakfast and 500 ml before each of the other two meals, allowing each time 30 minutes for the water to be absorbed into the digestive system and then into the blood before eating. It is better to drink more than this, always on an empty stomach, and to take enough unrefined sea salt to match our water intake. Doing this is already enough to ensure proper kidney function and elimination of the bulk of the metabolic wastes through the urine, preventing in this way the formation of kidney stones. More magnesium and less calcium The formation of calcium stones is more than obviously related to the fact that we are all in general over-calcified, consuming way more calcium than the magnesium needed to keep that calcium dissolved and flowing instead of settling and crystallising in our tissues, blood vessels, joints and kidneys. Therefore, to avoid calcification we must avoid over-consuming calcium (in fact, minimising calcium intake), and we must supplement with magnesium. This will also, over time, dissolve existing calcium stones and deposits in arteries and other tissues throughout the body. More alkaline and less acidic The kidney’s main purpose is to excrete acidic wastes by dissolving them in water. But all digestive and metabolic wastes are acidic, and there are many sources and forms of acid wastes that all contribute to increase the overall acid load on the body. In particular, refined sugars and protein. The heavier the load, the more acidic the blood becomes. Since the blood must remain alkaline, the acid can be eliminated, neutralised or stored in tissues. All three lines of defence are used: the kidneys try to eliminate as much as possible, alkaline minerals like calcium, magnesium and potassium are pulled out of the bones to neutralise blood acidity, and excess acid is stored away in tissues. Everything is done to take it out of circulation. The more acid is stored, the more acidic the tissues become. And the more acidic the body is, the less is its alkalising potential and the harder it is for the kidneys to dissolve and eliminate the acid that should be eliminated on a continual basis. There are fundamental physiological arguments that explain how tissue acidosis is at the root of literally every health problem and disease, (I will write about this more specifically on other occasions), but even without any further considerations, the only sensible conclusion is that the less acid-forming foods and drinks we ingest, the healthier the tissues, the kidneys and the body will be. The most strongly acid-forming foods are refined sugars. Next are meats, eggs and milk products, then flours, grains and starches. The most strongly alkaline-forming (acid-neutralising) foods are raw and green vegetables, especially salads and leafy greens, as well as watery vegetables like cucumbers and celery. The more chlorophyl, the more alkalising. Parsley, basil, cilantro and all grasses are therefore alkalising and cleansing superstars. Looking beyond single foods we find that certain combinations make the results indigestible and thus promoting of either putrefaction (protein with sugars or starches) or fermentation (simple sugars with most everything else). Both of these lead to the formation of a lot more acid waste in the digestive system a great part of which ends up the bloodstream. Adopting an alkaline diet will very quickly help balance blood pH and promote maximum excretion of acid wastes. Over time, this will allow the body to not only recover proper digestion and elimination on a meal-per-meal and daily basis, but also to eliminate acidic wastes stored in our tissues throughout the body, thus ridding it of aches and pains, the potential for chronic inflammation or infection, as well as for more serious degenerative diseases like arthritis, cancer and multiple sclerosis, for example. And finally, to stop taking so many things for granted is simple. We just need to pay attention to the details of our life and allow ourselves to be surprised, intrigued, inspired and amazed by what we encounter. Nothing more. We need to open to how things present themselves and just feel sensations with the actual feeling of the hands and fingers, of the feet and toes, of the belly, the chest, the back and neck. Really feel what is felt: the glass in the hand, the water in the mouth and then flowing in the throat and into the stomach. Actually see what the eyes are seeing: not things but forms and colours, light and dark, space and expansiveness in all directions. Actually hear what is heard in the whole space of hearing. This is how we can stop taking things for granted. Just paying attention to our life with our life. That’s all. This entry was posted in Understanding Health and tagged Creatinine, Kidney Function, Kidney stones, Urea, Uric Acid. Bookmark the permalink. Deep understanding, concise and clear language. Thank you, healthfully. Ca me fait le plus grand plaisir de savoir que c’est apprécié.